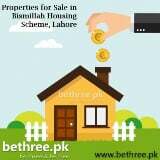 View properties for rent and sale on map in Bismillah Housing Scheme Lahore, choose map view from the search bar. Want to Sell your property or rent a house with easy step? Post your ad on [via Contact Form Below] for free.